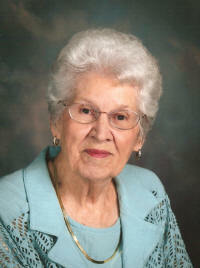 Marie A. Maue, nee Brunsmann, 88, Breese, died Saturday, June 13, 2009 at St. Joseph Hospital in Breese. Mrs. Maue was born March 12, 1921 in Beckemeyer to Charles and Louise (Kleber) Brunsmann; they preceded her in death. She married Earl Hoelscher in 1942, and he was killed in 1944 during WW II. She then married Paul Krebs, and he died in an automobile/train accident August 3, 1954. She later married Clarence “Bud” Maue on June 6, 1957; and he survives in Breese. Surviving are her children, Denver (Sharon) Hoelscher, Jack (Marion) Krebs, and Doug (Theresa) Maue all of Breese. 4 Great-Grandchildren, Brady and Sheldyn Rakers of Beckemeyer and Casey and Ty Garrett of Clarksville, TN. In addition to her parents, and husbands, she preceded in death by a brother, Karl Brunsmann. She was a member of St. Dominic Catholic Church and Altar Sodality, Daughters of Isabella Precious Blood Circle 718, American Legion Post 252 Auxiliary, and Breese Senior Citizens. Funeral Mass of Christian Burial will be Tuesday, June 16, 2009 at 11:30 AM at St. Dominic Catholic Church in Breese with Fr. Patrick Peter officiating. Interment will follow in St. Dominic/St. Augustine Cemetery, Breese. Visitation will be Monday, June 15, 2009 from 4:00-9:00 PM and again on Tuesday, June 16, 2009 from 9:00-11:15 AM at the Moss Funeral Home in Breese. Memorials can be made to donor’s choice and will be received at the funeral home. The Breese American Legion Auxiliary will hold services at 7:00 PM and the Daughters of Isabella will pray the Rosary at 7:15 PM on Monday evening at the funeral home.